At age fourteen, Faber’s dad bought him a drum kit which Faber promised to practice on every day. “Coming from a family of seven kids, this was a huge deal,” he remembers, “seeing as how my dad could barely even afford to feed us.” Faber may not have kept his promise, but that’s because he put down the drum sticks to become frontman and founding member of Faber Drive, one of Canada’s hottest young bands. After beating out more than 500 other artists from across Canada to take first place in a radio competition, Faber Drive started opening for notable acts such as Nickelback, Simple Plan and Hedley. 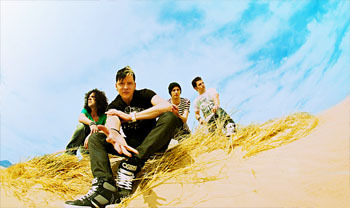 With the release of their pop-punk infused debut album Seven Second Surgery, Faber Drive hit 1 on Much Music, saw 3 top 10 radio singles and was nominated for the Juno award for Best New Artist in 2008. However, the Faber Drive that appears on its sophomore album can'T keEp A SecrEt is a band that has progressed beyond the Juno nominees of 2008. Where Seven Second Surgery laid the ground work for the Vancouver-based band’s career, can'T keEp A SecrEt now builds and evolves, deftly bringing bright colors, edgy tones, and more emotion into the fold and crossing the borders between Faber Drive’s punk rock roots into electro-pop mixed with epic balladry. “We wanted to take a risk with can’T keEp A SecrEt and move forward without forgetting our original sound or our dedicated fans,” explains bassist Krikit. “We wanted to write songs that would stand the test of time, and we wanted to have more control and coproduce with several different producers.” To that end, can'T keEp A SecrEt is a who’s who of the Vancouver music biz A-game, including Dave Genn (Matthew Good/Hedley/Marianas Trench), Dave “Rave” Ogilvie (Marilyn Manson/Nine Inch Nails), Brian Howes (Daughtry/Hinder/Hedley) and the insurgent likes of Josh Ramsay (Marianas Trench), Colin “Crocker” Friesen, and Jeff Johnson. Still Faber Drive is guilty of undue modesty. can'T keEp A SecrEt is bonded by the coherent force of a band ambitious enough to challenge itself and possessing the confidence and poise to actually pull it off. The first single “G-Get Up and Dance” was written and produced by the band in Faber’s barn, with Rave brought in as a coproducer and mixer in the final stages, helping launch the song to a platinum-selling iTunes grand slam in only 2 months. And “Our Last Goodbye,” the perfect pop punk throwdown, which cites the influence of old favorites like touring partners MxPx, and Green Day -- who also happen to turn up in album opener “The Payoff,” referenced alongside Oprah, Queen, and Rick James. Faber is quick to admit that FD gets a little “goofy behind closed doors,” and “The Payoff” somehow walks the line between tongue-in-cheek and triumph, celebrating the band’s success with an irresistible sing along pop-rock anthem. Pritchett, the young and extraordinarily talented son of Canadian country star Aaron Pritchett, joins powerhouse drummer Andrew Stricko, formerly of Hello Operator (who opened for FD on their sold-out cross-Canada “Seven Second Surgery Tour”) as the newest members of Faber Drive. That any of the ten tracks on can'T keEp A SecrEt would make worthy successors to iTunes gold favourites like “Tongue Tied” and “When I’m With You” goes without saying – as Krikit maintains, everything is a progression. And it’s definitely not a secret that there’s still a lot more in store for Faber Drive. So what is the big secret that they can’t keep? Pick up their sophomore album can’T keEp A SecrEt on November 10th to find out! Noteable Entertainment & Events is a Vancouver based booking agency, party rental, entertainment services and event production company. If you are interested in booking Faber Drive please contact us.